(Nanowerk Spotlight) α-synuclein is a protein whose function in the healthy brain is currently unknown. It is of great interest to Parkinson's researchers because it is a major constituent of Lewy bodies, protein clumps that are the pathological hallmark of Parkinson's disease (PD). Scientists believe that the self-assembly of α-synuclein into oligomers and fibrils is linked to progress and pathogenesis of the disease. As PD predominantly afflicts the elderly population, it is rational to assume that a slight delay in α-synuclein fibrillation may prevent or postpone PD pathogenesis. In recent years, researchers have found that some nanoparticles can inhibit α-synuclein fibrillation and also lead to the destruction of pre-formed fibrils. So far, though, it has not been clearly explained how nanoparticles interfere with the fibrillation reaction network – primary and secondary nucleation and elongation steps – making up the consequent fibrils. 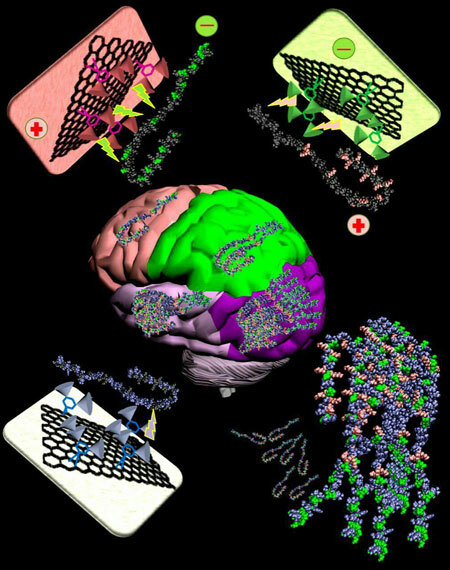 Matters are complicated by the fact that the available data on the therapeutic or toxic impacts of nanoparticles in amyloid-related diseases are in contradiction: Depending on their physicochemical properties and concentration, nanoparticles show different acceleratory or inhibitory effects on the fibrillation process. "The detailed mechanism by which fibril formation is inhibited is not well understood. Our recent study revealed how nanoparticles affect α-synuclein fibrillation," Morteza Mahmoudi, an Assistant Professor in the Department of Anesthesiology at Brigham and Women's Hospital and Harvard Medical School, tells Nanowerk. "We showed that electrostatic forces play a dominant role in the α-synuclein fibrillation process and hence, charged nano-objects are the best choice to block charged residues mediating self-assembly of α-synuclein. They can inhibit the primary and secondary nucleation and elongation phases." Mahmoudi and his collaborators have reported their findings in ACS Nano ("Mechanistic Understanding of the Interactions between Nano-Objects with Different Surface Properties and α-Synuclein"). The study's results suggest that important characteristics such as surface charge and surface functional group should be considered in the development of nanotechnology-based therapeutic approaches. "Understanding the detailed mechanism of interactions between α-synuclein and nano-objects with different surface properties can pave a new way to screen or design effective nanoparticles against α-synuclein fibrillation/fibrils," Mahmoudi points out. The team found that the physicochemical properties of nano-objects play a crucial role in dictating their interactions with α-synuclein. The charged nano-objects exhibit a strong affinity to charge residues of α-synuclein. The electrostatic force first triggers initial attachment of nanoparticles to α-synuclein and then van der Waals force stabilizes this interaction. "We show that charged nanoparticles inhibited the fibrillation process and dissociated preformed fibrils in a safe manner," Mahmoudi notes. "We also showed that they induce the formation of off-pathway oligomers – relevant because a growing body of evidence supports the critical role of oligomeric species of α-synuclein in the pathogenesis and progress of PD." In a next step, the researchers will study the in vivo therapeutic effects of nano-objects by probing how their physicochemical properties direct their biological fates and may dictate their interactions with α-synuclein in animal models of PD. "The passage of nanoparticles across the blood brain barrier (BBB) is one of the most challenging issues associated with approaches developed for diagnosis and treatment of neurodegenerative diseases," Mahmoudi concludes. "We are planning to develop small-sized nanoparticles, functionalized with ligands facilitating nanoparticle transport across the BBB, to improve nanoparticle delivery to the brain and study how physicochemical properties of nanoparticles govern their therapeutic/toxic impact in vivo."